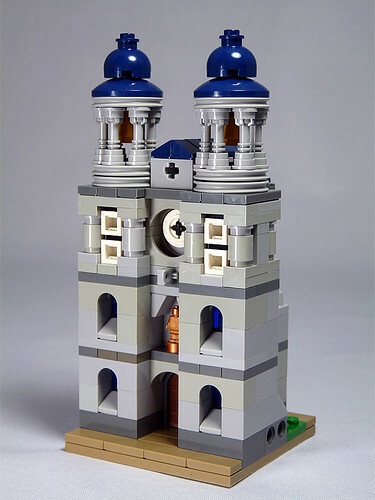 Brick Town Talk: Microscale Monday 02-11-2013 - LEGO Town, Architecture, Building Tips, Inspiration Ideas, and more! Abbey Road - (BTT) Religion is a touchy subject, as proven with the announcement that the Pope decided he's had enough of wearing pointy hats and riding around in Tupperware cars. Still, regardless of your own personal relationship with the higher power of your choice, it's hard to deny that some of the most important architecture is divinely inspired. This basilica, beautifully topped with striking blue roofs, exemplifies this point as well as any structure.